The day we all feel that little bit prouder to be British. TEAM UK have traveled as much as 1,000 miles from home to meet other like minded ‘pioneers of car audio’. Taking Audio to the extreme levels of installation and performance, you guys are constantly pushing boundaries and it was great to see you all receive the recognition for the hard work you all do. Well done to all that made up TEAM UK competitors & supporters that made the trip to Sazburg, giving the UK great presents at this show – I hope the good feedback from competitors around the world gets back to you about how good your cars truly are. – You did us proud. As we head for UK shores either by plane as a UK supporter (of which there were many) or driving the UKs best car audio vehicles through the continent, we leave carrying with us our pre-ordered 2018 EMMA CD’s and rulebooks, the famous nobbi discs for those lucky enough to get one, TEAM UK hoodies and polos oh and 4 EURO TROPHIES!!!! A huge congratulation to everyone that participated in the competition, you are all champions either of the UK or of the respective country representatives you have beaten along the way in the quest to be Euro Finals Champion. Sandra Kirton (‘That wicked loud bass lady’) Taking first place and crowned ESQL M Category European Champion. Peter from Team PS Sounds, Taking first place Skilled Multimedia 2.1 & 2nd place ESPL Trunk Unlimited. And finally, Graham from Team Bloomz taking 3rd place for EMMA Racing Stock, which is extra special as Graham will be the last ever person from the UK to win a trophy for EMMA Racing. RIP EMMA Racing as it is being replaced with a new format called EMMA Tuning. The British manufacturer of car audio Vibe also did very well as it won second place in Skilled 4000 euros (Built by Ketil in Norway) and second place in Entry 3000 (built by Ivan in Italy – the whole install cost £1100 using the Vibe Slick range of speakers!). 2018 brings with it a NEW CD, rulebook & set of judge-books. 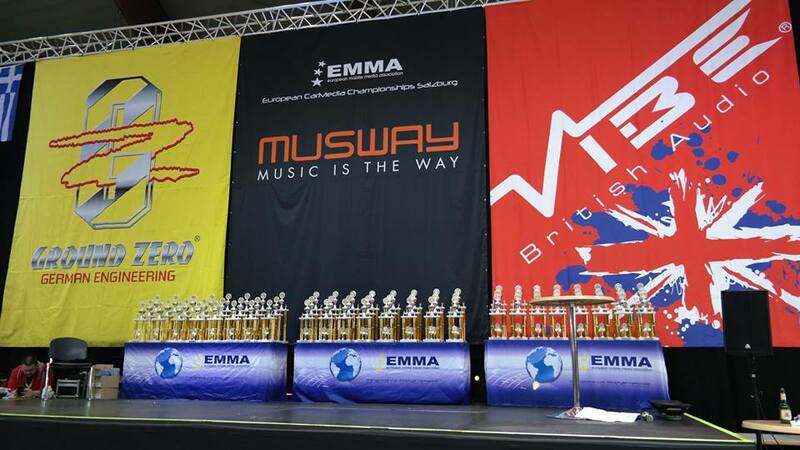 In order to give the UK competitors the best running start possible (we want you to win even more Euro Final Trophies for the UK next year), EMMA UK shall be offering all competitors a 2018 CD Seminar where you shall receive in-depth training and explanations of the new CD and how to use it as both a judgement CD (so that you can listen for the same things the judges look for) and an audio tuning tool to setup your car. This is being held on the 15th April in Hertfordshire. There are limited places, please therefore register in advance to avoid disappointment. EMMA UK has a lot planned this year to make the UK events even better, we hope you enjoy the upcoming season. EMMA UK will be launching its brand new website soon, keep an eye on our facebook page for more information. If you have never competed before and want to, the easiest thing to do is register for round 1, come and see what its all about and the friendly UK competitors and the EMMA UK judges will give you all the information you need to compete and hopefully win something. Round 1 is the 28th & 29th April, we look forward to seeing old faces and hopefully some new ones.